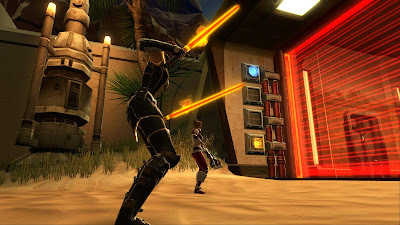 Going Commando | A SWTOR Fan Blog: Why Raid (in SWTOR)? Ich hoffe, dass macht Dir nichts aus?! Raiden war bisher aufgrund meiner mangelhaften Hardware keine Option. Nach einem Upgrade zu Beginn des Jahres steige ich langsam ein und es gefällt mir. Es ist schon ein ganz anderes Level an Gameplay. Die Anforderungen sind doch wesentlich höher, als wenn ich meine vier Leute in FPs -oder jetzt auch in Aufständen/Uprisings- heilen muss. Daran muss ich mich erst einmal gewöhnen. Vor mir liegt eine unglaublich große Menge an neuem Content, die ich mir in den nächsten Monaten/Jahren erschließen kann. Anti-raiders fear a divide between non-raiders and raiders, toxicity stemming from differences in skill, and losing out in equivalence (stats, importance in devs' and players' eyes, etc.) due to not having the schedule to spare for raiding. Raiders -say- that they enjoy the challenge of defeating difficult bosses and the socialing opportunities raids provide, but are either very quiet or very obnoxious about whether they think this makes them better than others who don't raid. Also, need/greed loot systems need to die in favor of personally rolled RNG loot or token buy, to reduce the disgruntled hostility between raiders in that very same group who got or didn't get a desired reward that day. I am waiting to see a brave game turn raiding on its head by making it just one of the activities by which one can get desirable rewards, but still make it possible to get equivalent stats elsewhere through other activities. What, you mean like SWTOR has done recently? ;) You probably haven't been following it, but they introduced a new loot system in the last expansion where everyone gets their gear from random loot crates that are earned from doing pretty much any endgame activity (raids, PvP, dailies, just killing mobs etc.). It's been largely reviled by the player base for its RNG aspect, but it does give everyone the same chance at gear. Some activities earn crates faster than others of course, but they are still working on rebalancing that. Raiding is actually one of the slower methods right now and has been promised a buff. Excellent. I haven't been following it indeed, but that is very heartening and positive news. It should be noted that they started to give loot in operations again. So it's not quite what Jeromai was envisioning. I don't have a problem with harder content giving out better rewards than easier content. I think a balance needs to be struck, but I don't think you should be able to gain absolutely everything from just one type of activity. And this means that there are certain cool things I know I shall probably never have (like Brontes' Wings of the Architect), and I'm okay with that. It also means that I prize my Qyzen Kephess customization a lot more than if I had just bought it from a vendor. It's a nice reminder that there was once a time when I actually did Nightmare mode ops, and it dropped, and somehow I bloody won it! (I think it drops in all modes, but it happened in the same op when I got the Warstalker title, probably the pinnacle of my SWTOR raiding career, and it has all been downhill since). I do think there should be a range of cool stuff available in every different activity. Just not necessarily the same cool stuff. I'm not a huge fan of this new system. I wish we could go back to the old loot drops in ops. I suppose it is more egalitarian, but it would be nice if you could skip the grind by doing harder content if you were so inclined. Nobody is denied anything by that, everyone has the choice to do it either way. @The Nickster: Well, he didn't say that raids shouldn't give gear, just that the same gear should also be available through other activities. Which it is. It's perfectly ok to have raids give out loot, especially if in the case of SWTOR (based on what I skim read regarding the command crate issues) it was too much lockbox RNG in play to give useful, desirable loot at a nice frequency. Then raids can be a source of relatively controlled, planned, guaranteed loot of whatever you want (token buy systems also help with this) and remain attractive to players, but importantly the players don't feel "forced" into one activity - if you're willing to put up with RNG or whatever, there is the alternative of the crates that give you a chance at the same loot stats you would get from raiding to choose from. Best is those that choose to do both, they get an extra source of loot, and the devs get a super committed player willing to do lots of different activities in-game. The camaraderie is entirely the reason I do ops, indeed it is the reason I am still playing SWTOR at all. All my best and most fun times in the game have been in ops or other large-group content (event bosses, world bosses, etc.) with my guild-mates. I've been very lucky that I found a group of folks who are so much fun to spend time with. Before I joined the guild I never did ops, I was put off with how angry and childish people in flashpoint PUGs could get, surely ops could only be worse, with the stakes that much higher. But with the right group of people it elevated my enjoyment of SWTOR to a whole new level. The guild is its own little culture, with banter, familiar characters, in-jokes, and shared memories (good and bad - our guild was formed from the wreckage of an earlier guild we were in that self-destructed quite acrimoniously). I don't suppose I would still be around if not for this comradeship, because I do regularly get tired of SWTOR and drop out for short (and sometimes not so short) periods. But it is always the prospect of fun with the guildies that brings me back, and ops are the best thing for that. I don't think operations are meant for pugging. I mean, you can do it, I certainly have, but they aren't really designed for it in my opinion. That's good though, because it's part of their appeal that you're meant to do them with people who stick together. Is the first picture one of those new(ish) Dark v. Light bosses? Haven't actually seen any of them yet myself.